Homeowners know it’s imperative to keep their house’s foundation free of moisture—you want your home to stay dry and free of mold. Groundwater in the basement or crawl space can be a breeding ground for mold, but also wood rot and an unstable home. While most think a sump pump is the only answer, it may be more practical to install a French drain system. A French drain is used to prevent ground and surface water from getting into building foundations, thus preventing any water damage. You can also find French drains used outdoors to distribute water (i.e., septic drain fields with a septic tank sewage treatment system) or behind retaining walls. The drainage system must partner with gravity to work. Weather Master can professionally install a catch basin, attached to a corrugated drain line. That’s when the drain angle and gravity takes over. 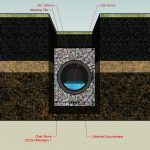 You will find a French drain in a residence in one of two ways: either buried around the foundation wall on the external side of the foundation or installed underneath the basement floor, on the inside of the perimeter of the basement. If the home is just starting to be built, an external French drain is installed around the foundation walls before the foundation soil is backfilled. Like a lasagna, the drain system is in layers: the drain or drain tile itself, a layer of stone, layer of filter fabric, then dirt and backfill. If a French drain is installed without the filter fabric, fine sediment and particles can make way through the stone throughout the years, thus causing clogs. If the home has already been built, installation of a French drain is a little more difficult and expensive to do, but still well worth the price. Is a French drain right for my home? If your home is prone to flooding, you have the option to choose between a sump pump or a French drain—both options can be installed by the professionals at Weather Master. 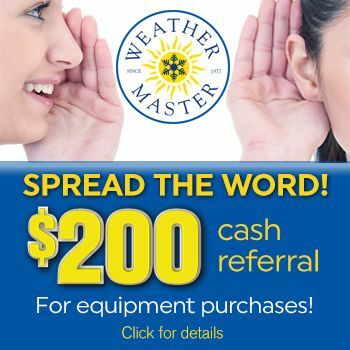 The one main difference between the two is the initial monetary investment, says Weather Master & Mr. Plumber General Manager Greg Worley. Not only can you use a French drain to keep your home dry, but if you have trouble with surface water (standing water in your yard or a washed out driveway). Contact Weather Master to discuss the best options to keep your home dry.